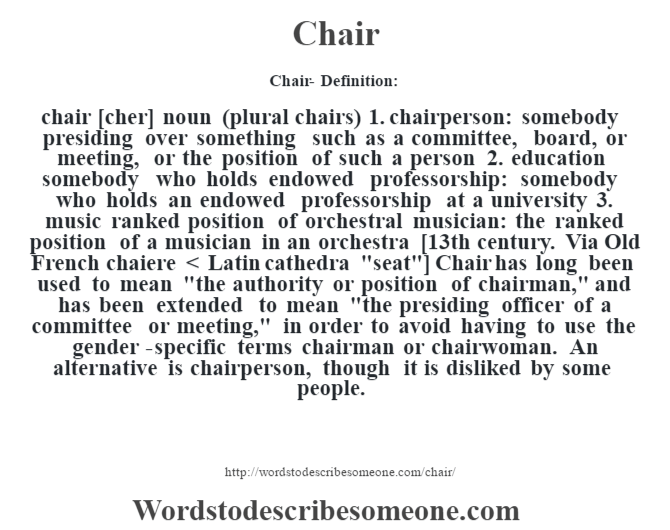 chair [cher] noun (plural chairs) 1. chairperson: somebody presiding over something such as a committee, board, or meeting, or the position of such a person 2. education somebody who holds endowed professorship: somebody who holds an endowed professorship at a university 3. music ranked position of orchestral musician: the ranked position of a musician in an orchestra [13th century. Via Old French chaiere < Latin cathedra "seat"] Chair has long been used to mean "the authority or position of chairman," and has been extended to mean "the presiding officer of a committee or meeting," in order to avoid having to use the gender-specific terms chairman or chairwoman. An alternative is chairperson, though it is disliked by some people.